28 August 2015 - An elemental piece of theatre, depicting the violence that lies dormant in us all. 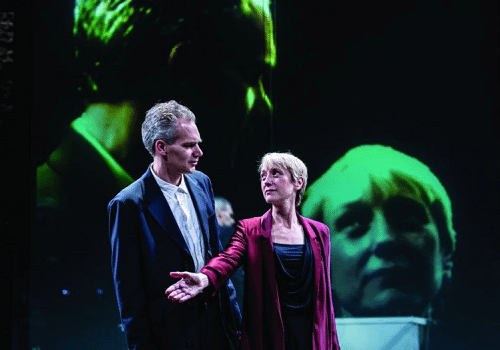 Oresteia arrives in Studio 1 of London’s Trafalgar Studios following a hugely successful and highly praised run at the Almeida Theatre. Robert Icke not only adapts the ancient Greek text by Aeschylus, but also directs the piece, which is an amalgamation of three tragedies. This modern re-staging of Oresteia tells the tale of a ruthless and bloody battle between the cursed House of Atreus. Set in the aftermath of the Trojan War, Klytemnestra awaits her husband, Agamemnon’s return. Unfortunately for Klytemnestra, her husband brings more than she bargained for back into their marital home. As Klytemnestra plans to exact her revenge, she sparks a huge and gory war between the spouses and the family which will span decades and divide blood ties into sides in an endlessly raging war. Oresteia is made up of three plays; Agamemnon, The Libation Bearers and The Eumenides, told chronologically with each play picking up where the other left off. Due to the action and plot rich presentation, the running time of Oresteia is 3 hours and 40 minutes with a break of 10 minutes and an interval of 15 minutes. Casting includes Lia Williams as Klytemnestra, Lorna Brown, Jessica Brown Findlay, Annie Firbank, Joshua Higgott, Luke Thompson, Angus Wright and Hara Yannas. Alongside Icke’s direction, the creative team includes designs by Hildegard Bechtler, video by Tim Reid, Sound by Tom Gibbons and lighting by Natasha Chivers. 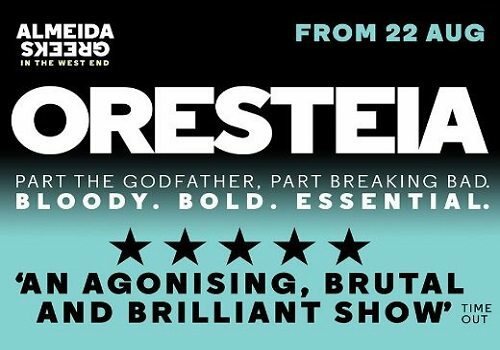 Oresteia, which TimeOut have claimed is “part The Godfather and part Breaking Bad,” runs at Trafalgar Studios 1 from 22nd August to the 7th November. One thing is for sure, this show is absolutely not to be missed. Oresteia is NOT suitable for children. Not only is the show 3hours and 40 minutes long, it is also somewhat gruesome in parts.